In 1889, Bruce Wayne returns to Gotham City and takes on the mantle of Batman, and soon finds himself hunting Jack the Ripper, who has fled England. In Austria, Sigmund Freud tells Bruce, “A good student, you have been. My friend, the English detective, said much the same thing,” a clear reference to Sherlock Holmes. Given the recasting of the Batman mythos in the Victorian era, and the final revelation about the Ripper's identity, this story obviously takes place in an AU. 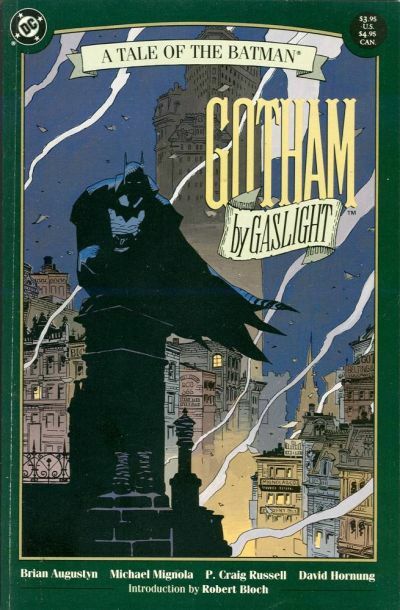 This was the comic that first brought Mike Mignola to the attention of fans before he created Hellboy. There was a sequel with some else on art. Mignola also did a Batman/Cthulhu Mythos crossover The Doom that Came to Gotham. I haven't read it since the comics are really expensive. From what I've read about it, it's probably also an AU. Mignola also did the Batman/Hellboy/Starman crossover that Win included in Crossovers (one of my favorite comic book team ups.) There was also Batman: Legends of the Dark Knight #54 Sanctum which was very Lovecraftian.